A SPECIAL event celebrating the 50-year history of Formula Ford racing will highlight the expanded support race program in place for the 2019 Liqui-Moly Bathurst 12 Hour. A full grid of Formula Ford 1600 and Historic Formula Ford competitors will highlight the remarkable, five-decade long contribution of the category to Australian Motorsport. Formula Ford will join an expanded support race program that includes the return of the Combined Sedans category, Group S Historic Sports Cars and the opening round of the Radical Australia Cup. On track action will commence on Thursday, 31 January 2019 with racing across Friday and Saturday. The milestone anniversary event represents a collaborative effort between the Formula Ford Association and the Historic Formula Ford Australia group. 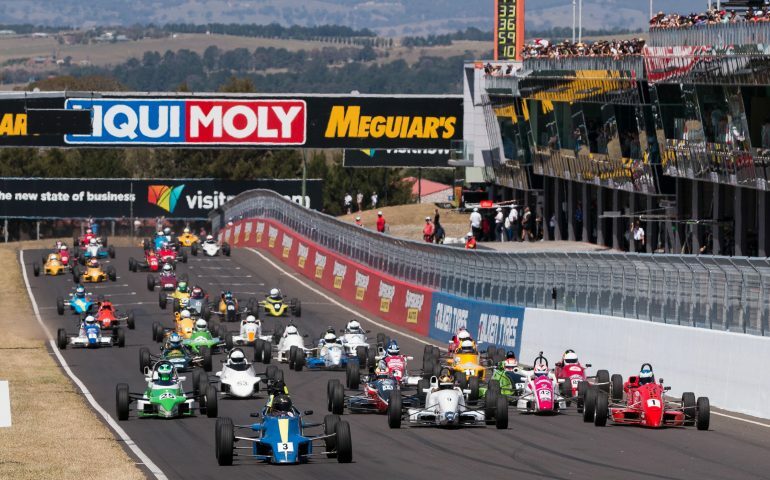 “Bathurst will be the start of a year that will celebrate 50 years of Formula Ford racing in Australia and to commence it at such a high-profile event is a huge boost for the category,” said Formula Ford Association representative, Phil Marinon. Liqui-Moly Bathurst 12 Hour Event Director Kurt Sakzewski welcomed the open-wheel category to the 12-hour support program. “In expanding the support category component of the event, we were careful to select a significant category that would enhance the on-track offering to spectators. In a milestone event for Formula Ford, we are confident we have found that. Returning to the Liqui-Moly Bathurst 12 Hour program will be the Combined Sedans category, Radical Australia Cup and Group S Classic Sports Cars. Combined Sedans lives up to its billing as a place for sedan-style racing cars to complete amidst a mixed and varied grid that includes ex-Supercars, TA2 Trans Am racers, Sports Sedans, Improved Production Cars and more. Steven Lacey took two wins from three races in his Camaro Sports Sedan this year, while American Gar Robinson starred in his TA2 Dodge with a pair of second place finishes. Group S made their Bathurst 12 Hour debut in 2018 and fronted with a full grid of classic Sports Cars from the 1950s, 60s and 70s. The class is something of a precursor to the current GT3 competition; featuring a grid of modified sports and GT vehicles designed for the road but modified for the track. Two wins and a second handed 1976 Porsche 911 racer Wayne Seabrook overall honours in February this year. The Radical Australia Cup is a popular one-make Sports Car category with the grid of four-cylinder Radical SR3 LeMans style cars always putting on a show. Sydney drivers Kim Burke and Peter Paddon split the victories in their corresponding round this year. Support category action at the Liqui-Moly Bathurst 12 Hour commences at Mount Panorama on Thursday, 31 January ahead of official practice for the 12-hour grid commencing on Friday morning.